When the Mughal emperor Jahangir died in 1627, his third son, Shah Jahan, became the new emperor. He immediately imprisoned his stepmother Nur Jahan so he could rule himself. Shah Jahan married Nur Jahan’s niece, Mumtaz Mahal. Shah Jahan and Mumtaz Mahal were very close. She had fourteen children, but he kept political power. He spent most of his time fighting threats to the Mughal Empire – a Sikh rebellion, Portuguese traders, British traders, and Jesuit priests. Shah Jahan recaptured Kandahar from the Safavids, but then lost it again ten years later. 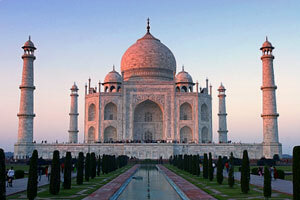 After Mumtaz Mahal died giving birth to their last child in 1631, he built the Taj Mahal as her tomb. But in 1658, Shah Jahan’s third son Aurangzeb pushed him aside and took power for himself. Eventually Aurangzeb killed Shah Jahan. Like other rulers at this time – Louis XIV and Peter the Great and the Kangxi Emperor, for example – Aurangzeb tried to centralize power. He wanted to control more of the business of his empire than earlier Mughal rulers had. Aurangzeb – again like Louis XIV – rejected freedom of religion. He insisted that Sikhs and Hindus and Christians convert to Islam. Just as the Kangxi Emperor conquered southern China, Aurangzeb also conquered most of southern India. But Aurangzeb’s persecution of non-Muslims led to resistance movements. In central India, the great leader Shivaji represented the Hindus, and in northern India, the Sikhs resisted too. When Aurangzeb died in 1707, he was 88 years old. Even his son Bahadur, who took power after him, was already 63 years old! Bahadur only ruled for five years before he died too. With Aurangzeb and Bahadur gone, all the people who were unhappy in the Mughal Empire broke away from it and started their own countries. The Maratha Empire, organized by Hindus in the middle of India, slowly spread until it controlled most of India. The Sikhs created their own Sikh Empire in the Punjab, in north-eastern India. Soon nobody even cared who the Mughal Emperor was anymore. In 1739, the Iranian leader Nader Shah, realizing how weak the Mughals were, invaded India and sacked Delhi, carrying off tons of gold and jewels as plunder. 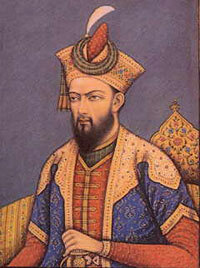 Nader Shah didn’t hold India very long, but his success showed the British traders in India how weak the Mughals really were. Then Afghanistan, under Ahmed Shah Durrani, expanded south to take over the whole Indus Valley (most of modern Pakistan). The British army was worried that their trade with India, where they made so much money, would be wrecked by all these new small countries, so the British began to make their own plans to conquer India. Cite this page: Carr, K.E. The end of the Mughal Empire in India. Quatr.us Study Guides, July 19, 2017. Web. April 26, 2019.